Just wanted to give an update on our newest family members. Ludacris and Major were adopted in February 2012 and Odessa was adopted in October 2012. The are the greatest dogs ever. Although Odessa does have some nonsharing issues, they all get along well. She hates for the boys to have any toys at all, but we are working on that. Major is a very special dog. He is very old and has a bad heart and some days he is just laying around and you can tell he doesn’t feel well. Other days he is like a pup. 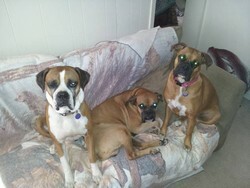 We love these boxers and would like to say thank you to all ABR volunteers for saving these dogs for our family. Also special thank you to Jen for not giving up on my old man Major, because of you he will live the last years of his life knowing he is very loved even though the first years of his life were not good.